The Counter-Terrorism Rewards Program, administered by the United States Department of State offers monetary compensation for individuals who volunteer information that leads to the location, capture, and trial of suspected terrorists. The program also seeks information relevant to finances, assets, and plans of terrorist organizations. The Federal Bureau of Investigation (FBI), and the Central Intelligence Agency (CIA) work closely with the Department of State to investigate all information garnered through the Counter-Terrorism Rewards Program. In 1998, after the bombing of United States embassies in East Africa, the Department of State raised the maximum reward for information to $5 million. The rewards program not only offers monetary rewards for information aiding anti-terrorism operations, but also promises confidentiality and anonymity for the informant. The United States government further promises to aid and relocate informants whose disclosure of information places themselves, and their family, in jeopardy. The Counter-Terrorism Rewards Program is now a part of a larger anti-terrorism operation, the Rewards for Justice Program. The program pays for information relevant to the arrest and capture of wanted terrorists, both domestic and foreign. As part of the Patriot Act of 2001, the secretary of state can pay rewards greater than $5 million for information leading to the arrest of suspected terrorists. To date, the program has paid $9.75 million to 24 individuals who aided government antiterror investigations. The Counter-Terrorism Rewards Program, as part of Rewards for Justice, has had several key successes. Information received through the program led to the arrest and eventual conviction of the 1993 World Trade Center bomber, Ramzi Yousef. The highest current priority of the rewards program is information leading to the capture of al-Qaeda front man, Usama bin Laden, and others with suspected involvement in the 2001 attacks on the World Trade Center and the Pentagon. 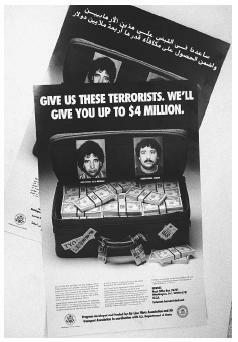 Wanted posters, released in English and Arabic in 1995 by the FBI and State Department, show two suspects wanted in the bombing of Pan AM flight 103 which exploded over Lockerbie, Scotland in 1988. U.S. Department of State. "Rewards for Justice" (April, 29,2003)< http://www.rewardsforjustice.net/ >.